In our previous episode of Crafts for the Craft-Challenged, we tackled a small spool doll nativity consisting of Baby Jesus, Mary, and Joseph. This time, I'd like to show you what I did for the shepherds, the wise men, and an angel, in case you're inspired to create the whole cast. Shepherds: I did them identical to Joseph-- the only difference is a lighter shade of corduroy! Wise Men: They each got robes of purple corduroy, though I gave them each a belt from a different trim so they wouldn't be identical (like the shepherds.) I used some gold lame ribbon for their crowns, but if you look at the top of their heads, you can see the hole that goes through the bead! Angel: She had her gown and wings made from some Christmas ribbon-- I tied a bow with a piece of string and glued it on the back. She also got a pipe cleaner halo glued into the hole at the top of her head. And here they all are! 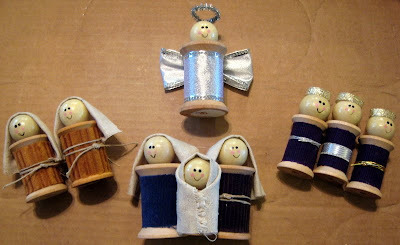 If you make your own spool doll nativity, I'd love for you to leave a link here. I'm sure there are several out there who are much less craft-challenged than I and will come up with all sorts of cute ideas to add to this. That's exactly why I made this nativity, Andrea! I wanted our MOPS moms to have a nativity set that their kiddos could play with-- too often they're meant to sit on a shelf and just be another untouchable "pretty." I love this Nativity! If you have your kids help you make it, you will have a priceless set you will never want to part with. Saw you on OnePrettyThing...Very cute! Obrigada para suas palavras amáveis, Silvia. These dolls are very cute. I think I remember trying to make then in school. Will you check out my blog. I'd love some feedback.